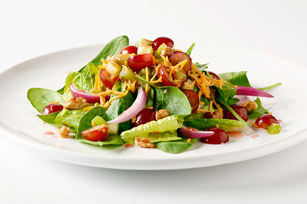 Toss veggies, cheese, red grapes, toasted walnuts and vinaigrette make up this tasty grape salad. You'll love this Cheddar, Walnut and Grape Salad. Toss spinach and romaine with onions; spoon onto 4 plates. Top with grape mixture and nuts. Prepare using KRAFT ROKA Blue Cheese Dressing. Look for grapes that are well colored, plump and firmly attached to the stem. To store, place unwashed grapes in a plastic bag. Store in the refrigerator up to 1 week and wash just before using.